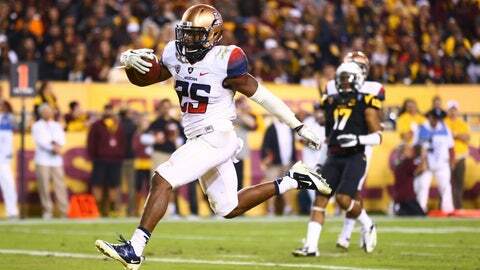 Ka'Deem Carey holds Arizona's career record for rushing yards and touchdowns. "That means a lot and that coach Rich Rod (Rodriguez) had a plan for me and this front line had to work for me," Carey said after Wednesday’s practice for the AdvoCare V100 Bowl. "Another year of (being) a consensus means we were working. We put a lot of work into it, and it paid off." Carey semi-joked that he could make a decision on what he’ll do next year on Thursday, but his plan is to "make it out to the bowl game and see how it goes. It’s one step at a time." It’s well-earned and an accomplishment for him and for the guys around him. He’s had really good years and worthy All-American years. "It’s well-earned and an accomplishment for him and for the guys around him," Rodriguez said. "He’s had really good years and worthy All-American years." "He earned a lot this season," Rodriguez said. "Some of it was really good blocking, but some of it was really good effort."